I wanted to tell you about my dad. I wanted to tackle a subject that I couldn't turn into a joke. 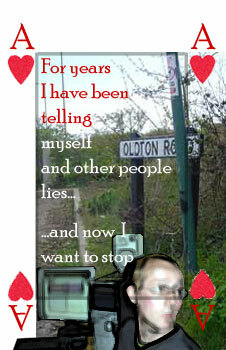 Instead, for the best part of a year, I have been constructing an elaborate fabrication, a house of cards, a pack of half-truths, a disappeared town called Oldton (Oulton? Olton? Owlton?) that I share with several dozen people, many of whom I have never even met. What was fact and what is fiction have become entirely confused. And yet I have learned one thing. The only 100% truth is being here now. In the present. Not the past or the future. And the only reality is the people you love. Everything else is memory, imagination - and digital noodling.